Cardinals live in Upstate New York all year long. When the snow arrives, they spend some of their days perched in the pine trees. 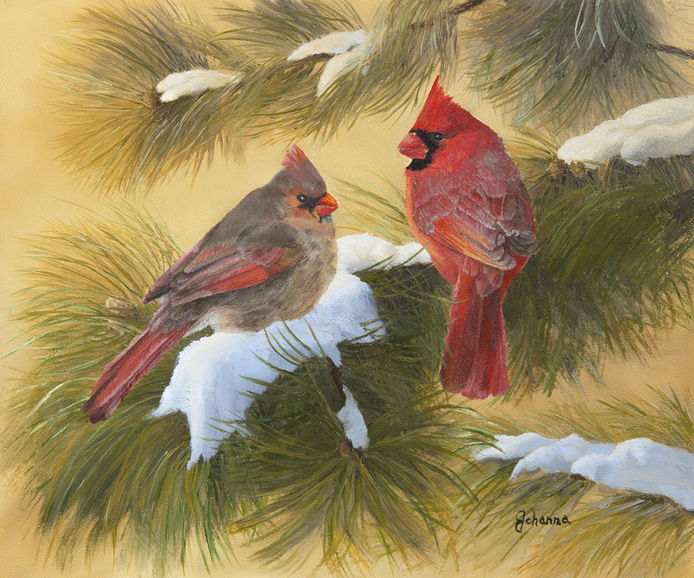 This painting of a pair of cardinals is enjoying the warmth of a Spring day as the snow melts around them. Cardinals are monogamous and remain close to each other throughout the year and you can often hear them singing to each other. Cardinals eat mostly seeds, insects and berries and often visit bird feeders, especially if there is black-oil sunflower and safflower seeds available.